I'm one of those people that actually likes Daylight Savings. I'm not a huge fan of the disruption to my sleep routine that occurs when Daylight Savings Time starts and ends every year. But I love that Daylight Savings Time makes summer evenings stay lighter for longer. You never hear anyone say in July, "Gee I really wish it would get dark at 8:00 tonight - stupid daylight savings." I will admit that maybe somebody who was waiting for dark to watch an outdoor movie or fireworks might wish that it got dark earlier. But every other night they are probably glad that daylight sticks around for an extra hour than it would otherwise. Of course no one is thinking about summer evenings when they have to get up an hour earlier in the spring. It is hard, I'll give you that. Another thing that gives Daylight Savings Time a bad rap, is that it can be very confusing to understand. I've gone ahead and made a little guide with some things you can expect when Daylight Savings Time begins in the Spring and ends in the Fall. I've included what kids will do with the time change. I've also added what you can expect if you are lucky to be on vacation when there is a Daylight Savings Time change. This is when we move the clocks an hour ahead. That means that what was once 6:00 am becomes 7:00 am. If you are used to getting up at 6:00 am, then it is suddenly going to feel like you are waking up at 5:00 am. This is the change that hurts when you have a set schedule, or early morning appointments, or really any sort of commitments. You and your kids are going to be sleepy. If your kids normally get up at 7:00 then they are going to want to sleep in until 8:00. For stay at home parents with young children who aren't in school it's great - for everyone else it's like pulling teeth to get up in the morning. But if you are on vacation then you get to sleep in. 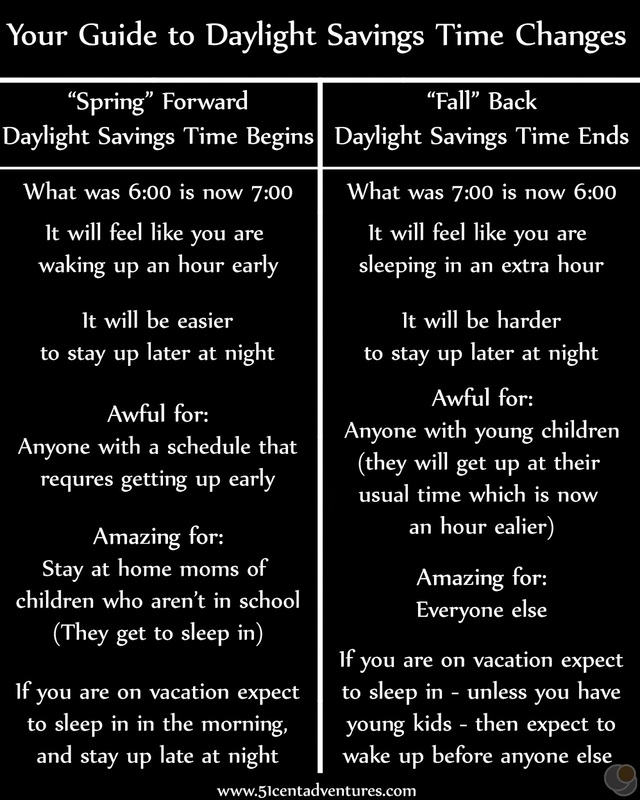 My husband and I discovered this a few years ago when his Army leave time coincided with the beginning of Daylight Savings Time. Our kids were too young to know about the time change. Before the change they would wake up at 7:00. After the change they would sleep until 8:00 every day. My husband and I loved the "extra" hour of sleep. This is when we move the clocks an hour back. That means that what was once 7:00 am becomes 6:00 am. If you are used to getting up at 6:00 it's going to feel like you are getting up at 7:00. You just gained an hour of "sleeping in." It's blissful. Unless you have young children. Then it's awful. Kids don't understand the time change. They will still wake up at their normal time. So if they normally wake up at 7:00 they are still going to wake up at 7:00 only now it's 6:00. This is not cool. It can still work for you though if you happen to be on vacation. If you have young kids you can use them as an alarm clock to make sure you can get up early to get a head start on the day. This happened on our Texas Coastline Road Trip. Our kids would wake us up at what would have been 7:30 only now it was 6:30. Sure it was kind of ridiculous to get up that early on a vacation - but time is kind of meaningless on vacations anyway. We were able to have breakfast and take down camp before 9:00. Then we had the whole rest of the day to play. I know this week is probably going to be rough on just about everybody. But before you start whining about it, please take a minute to think about all the great things you'll get to do this summer. And remember, it only takes about a week before you adjust to the change.